The MC-2. The reimagined update to our MC-1 classic. For any DermaWave model produced since 2002, just plug it in. No new machine required. Drive it in automatic as it sets itself. And with an new 'LED Booster' built in. If bought at time of new machine purchase: $750. The newly modeled revamp of our original MC-1 Micro-Current Head, now resculptured into a form-factor case style that's won an International IF Design Award. Described as "sensual" in its feel, it nestles into the palm with complete grace. And it includes a new, more powerful and recessed Med-Grade LED between the probes. Yes, with true pro-level microcurrent machines often running between $5,000 ~ $10,000, we could have developed, produced, and sold an entirely new package involving a whole new console to drive the head. But we didn't. We didn't have to. But Fully Regulated Micro-Current Coming Out of a 'Light Machine'? Yup. ... And a head that contains its own, dedicated internal circuit as something akin to a 'machine-ette', in its own right, that works in tandem with the circuitry operating within the DermaWave console. treatment is documented with the identical light - coming from the identical direction. For it is, after all, a single digital camera frame. Same shot. From the camera of Master Esthetician, Leslie Saben, using our original MC-1 Head. QUICK NOTATION: The camera was inadvertently closer in the before shot to the right - and the head is poised a bit lower in the frame, so the amount of 'chin lift' wouldn't be as dramatic as it might seem at quick glance. But we wanted to present Leslie's photographic comparison exactly as she presented it to us. Still, the 'trends' can be easily seen - as well as something Leslie didn't label: A far better skin texture and tone. Wonderful. So, what's with the face's own, innate electrical parameters? Resistances? Capacitance? Surface impedance? They represent the 'electricity' - as well as the resistance to the same - that's already in your body. It, in part, is what allows 'touch screens' (such as that of an iPhone, say) to work in the first place. And in mapping those parameters in dozens of face locations, one can 'chart' the parameters that all faces have in common. Thin ones. Fat ones. In-between ones - where, for example - all faces have less electrical resistance at the cheek bones, relative to the more fleshy area just below them. Same for the forehead. And the chin. The jaw line. And with that 'map' one can then potentially automate the output of microcurrent probes on the basis of where they're placed - at what location ... even as they move. And those very same output probes, in between output phases, can measure the skin's surface impedance as an input to the console ... that 'directs' or 'orchestrates' the output. In short, automation - requiring one to set nothing. Or worse ... having to 'guess at it'. For while many people still see our DermaWave console 'outputs' as "output jacks", we've always called them 'Smart Ports' - as access points in the 'Feedback Loop', capable of accepting an 'input' (such as that of a photo-optical sensor in the DermaWave LED heads). Moreover, imagine having the electrical resistance between the probes being modulated dynamically - the very thing that happens when one probe is gradually moved away from another stationary probe, as in other microcurrent systems. Only our probes have the capability do that electronically - with the spacing between the probes remaining physically stationary and constant. Imagine that. We did, after all - while others ... seemingly did not. 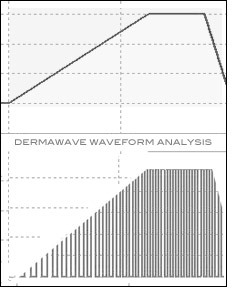 By the way ... the DermaWave MicroCurrent Head requires NO conducting gels, whatsoever. In fact, we ask that the face be clean and relatively oil free. So, no - you won't have to buy what are often expensive jars of 'goop' from us, month after month. It's just not necessary for our design - and the way we 'lay down' currents. Our user manual simply shows you the direction to move the head at different face locations. The rest of the "training" is already 'engineered in'. You just move the head - with it's 50mm (2 inch), laboratory-grade stainless steel bar probes - and let the system do its thing. Done. Simple. Still, this is a professional system, boys and girls - not some at-home Chinese consumer gadget sold on late-night TV or various places along your the internet journeys. Our MicroCurrent Head just works as simply. In the waveform analysis shown here, those familiar with waveforms may see it as a variant of a 'saw-tooth' wave. It kind of is ... but we more accurately created - in this one example - what we call a 'ramp and hold' wave. And that wave is made up of multiple pulse waves. That's two dimensions happening at once. And notice how the smaller 'waves' (below) slightly vary in 'width' and relative 'spacing'? Yeah. That's deliberate. And that's a 'third dimension'. Moreover, all of this can happen in a fraction of a single second. And the very same theory can be applied to ... square waves, triangle waves, sine waves ... or even 'custom waves', as shown in the example. And, in the space of a mere second or two, the probes have the capability of running through a whole host of waveforms - faster than you can turn around to change 'programs', hoping you're using the right one. Our probes can deliver it all - without you having to refer to the manual because you 'forgot'. You ... don't even have to think about it. No more than when you load a 'multi-waveform' song into your 'music player'. And here, the 'music' is already in the 'player' - and changes 'the song' as you move it around. Even its 'loudness', sweeping all the way down, in theory, into the nano-current range, as it sees fit. This kind of technical description may make your head hurt. But using it ... won't. So ... in the final analysis, this is what you get: First know that normal cellular reactions (that include 'currents') slow down as we age. By electro-stimulating the skin cells in a variety of ways and increasing the production of 'Adenosine Triphosphates' (ATPs) within those cells, there can be - net result - the reduction in fine lines and much better skin texture - as well as offering the electro-impulse 're-training' of facial muscles. So yes, the process has lifting potential - that which most separates it from LED treatments (which have their own, unique benefits). But outright 'turkey necks'? Eh, modest improvements, depending upon severity. Alas, some things still do require surgical procedures. Still, some nice lifting potential in other areas, jaw bone to cheek bone, and above. Other positive changes take place, as well - such as improved circulation and even an increase in metabolism. Most of you here are professional users and you already know the deal. That's why we've dedicated most of our time here explaining our specialized and unique technological approaches to delivering the procedure. Beyond that, we've included a sizable, optic-driven photo-rejuvenation LED that lays down a 20mm spot size between the probes. But know that it's not the equivalent of our dedicated LED heads. Those are larger, have photo-optical sensors - and are more powerful, surely. 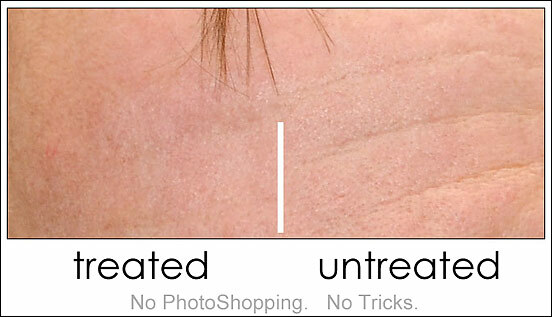 We simply have added a remarkable LED with a rather large projected spot size as a 'Booster' that gives a 'light dose' of photo-rejuvenation during the MicroCurrent process. Consider it as 'value added' for you ... and your clients - not a spot-on equivalency. Okay? In fact, if you're just starting out, we'd recommend our LED systems first - with our MicroCurrent head as a great companion that can be added at any time, naturally. That's our opinion. LED first. Then consider MicroCurrent. 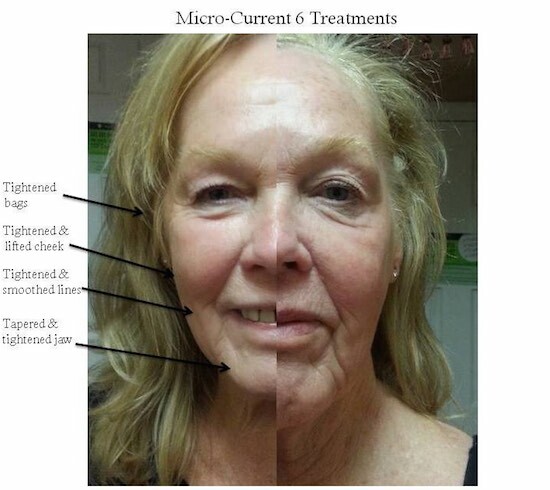 But yes - as some of you might wonder - one can just buy a DermaWave console and a MicroCurrent head without an LED head, just for MicroCurrent treatments. That's up to you. We've seen many recommend - as a 'course' - a series of anywhere between 8 ~ 12 sessions. We say, at least with our head, 6 sessions (much like photo-rejuvenation). Then assess. It will naturally depend upon the severity of what's laying before you. Sessions may be once or twice a week, say, and are often dependent upon the weekly affordability to the client. Touch-up sessions ... monthly, say. This will be somewhat variable, depending on lifestyle, inclusive of sun exposure (much like Photo Rejuvenation, again). Using it more frequently will do no harm, certainly. Which comes first for 'twin sessions' - LED or MicroCurrent? In theory, it doesn't matter. But in practice, we'd do MicroCurrent first with the LED session as the follow-up. We say this because MicroCurrent can momentarily cause a bit of redness in some people. The LED session will bring all back to normal (even a couple of minutes of it). dermawave. it's now even more current ... as well as ahead.